A new study on shade-grown coffee makes a bold, nearly unqualified claim: “Ethiopian shade coffee is perhaps the most ‘bird-friendly’ in the world.” In scientific jargon, perhaps really means pretty much or almost certainly. The claim is built on three years of research in the Oromia Region of the Ethiopian Highlands. The paper was just published in the journal Biological Conservation. 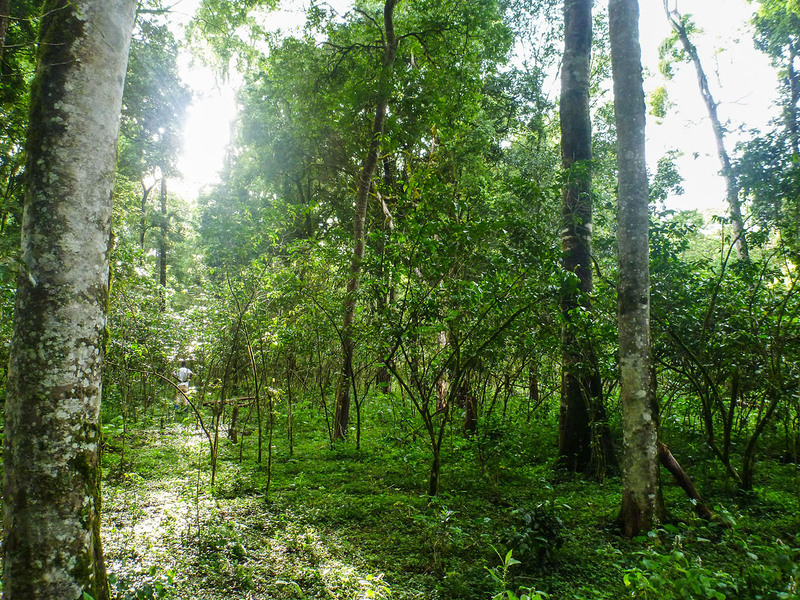 A team of researchers led by University of Utah doctoral student Evan Buechley strung up nets in shade coffee farms and nearby, but not connected, forests to catch and count the birds living in the two habitats. Before this study, little research had been done on the effects of coffee farming on Ethiopia’s rich assemblage of bird species. Buechley and the paper’s other authors hope their findings will raise the profile of traditional Ethiopian shade-grown coffee as an ecologically appealing crop, which would create higher prices, which would encourage farmers to retain or revert to this traditional growing practice. With the increased prominence of the Smithsonian Migratory Bird Center’s Bird Friendly certification, shade-grown coffee has become one the major cause coffees. The concept of bird-friendly coffee is pretty straightforward. Provide birds, bats, insects, and other animals a habitat above and among the low-growing coffee trees and you’ll diminish the negative effects forests feel when they’re used as farms. Done right, you might even foster a winged pest-control squad. What makes Ethiopia’s shade coffee farms the most bird-friendly? In shade coffee, the best practice is to use native trees, since it gives local birds a nourishing habitat similar to the surrounding forests. But even if all the other trees and shrubs were native, you’d still have one stranger: the coffee trees. That is unless you’re in Ethiopia. Buechley and his colleagues say Oromia’s coffee farms, which grow heirloom varietals with organic inputs, are little different from the surrounding forests. Few farms in Ethiopia are certified Bird Friendly, and Buechley wants the Smithsonian to assist their certification so the farmers can gain the substantial markup for a Bird Friendly crop. The most remarkable finding of the study—it’s the one that gives weight to the claim that Ethipia has the most bird-friendly coffee—was that each of the nineteen species found in the forests was found in the shade coffee farms. That had never been documented before, and it jazzed the scientists. “These species include forest specialist and understory insectivores, which typically are the first to disappear from modified forests,” Buechley wrote to Fresh Cup. An additional thirty-two species were found in the coffee farms, showing how attractive they are to birds from a range of habitats. 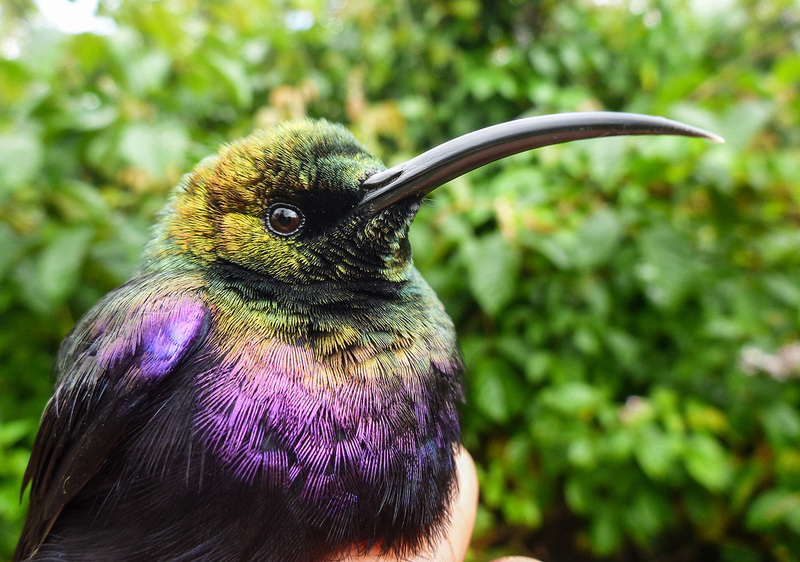 A Tacazze sunbird caught and released during the study. It’s a nectar-eating bird in Ethiopian forests. —Cory Eldridge is the editor of Fresh Cup. Kingfishers are his favorite birds.